Reinforcement is a key component of effective instruction for students in special education as well as general education settings. When I say reinforcement, though, I don't necessarily mean treats. Reinforcement is anything that increases a behavior or a skill that it follows. Consequently giving an M&M for a right answer might increase correct responding, but if it doesn't, then it isn't really a reinforcer. On the other hand, some students will increase their correct responses for a teacher's smile. And ultimately we want the students to improve performance for the grade and sense of satisfaction they receive. I typically work with students with autism and students who have behavioral challenges of other kinds. For those students, reinforcement is sometimes a bit more complex and complicated. For many students it is difficult to determine what might be a reinforcer. For others, they get bored easily. 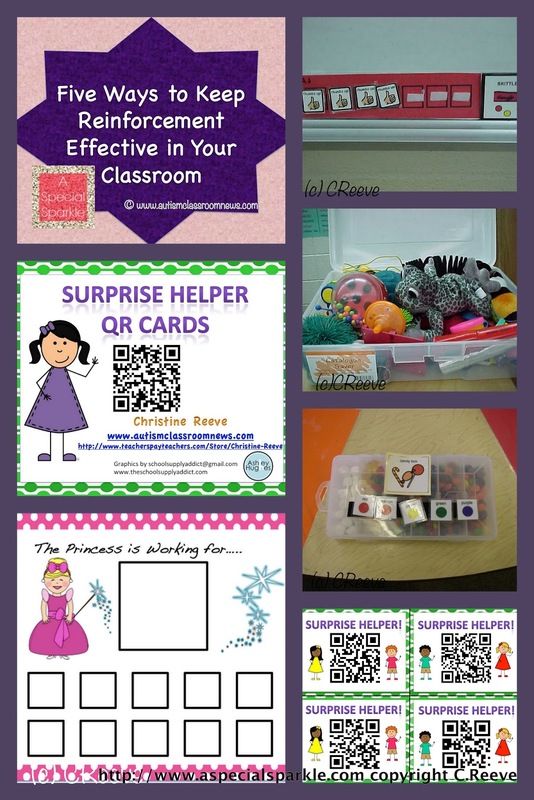 So to meet that challenge I thought I would highlight 5 ways that you can keep reinforcement effective in your classroom and give you a couple of freebies to help with that too! Make sure to only reinforce specific behaviors or skills. Remember to point out the behavior/skill you are reinforcing with specific praise (e.g., I like the way you walked quietly in the hall!). In most cases, it will be most effective to make sure that you only reinforce specific skills or behaviors that you are targeting and don't reinforce if the behavior / skill isn't right. Individualize your reinforcement. For general education classrooms a classroom management system might be effective with group consequences. However, those can also lead to students who struggle with behavior being singled out by the rest of the class because they cost them the reward. For students in special education especially, make sure that you have a system that can be individualized to him or her so that he wins more than he loses. Don't tie performance to other students that he or she doesn't have control over. Most students with behavioral issues also have social skills issues that make it difficult to negotiate team work. They also tend to focus on how things are out of their control when they fail to behave appropriately or do well on an academic task; so if they lose out on a positive consequence because of someone else's behavior (real or perceived) it ceases to have meaning for them. They can't control it, so why try. And remember, just because I like sushi and would eat it all day long, doesn't mean it would be a good reinforcer for you. You may hate it and it may actually keep you from doing your best because it is a negative consequence for you. Find reinforcers that work for the individual. Cast a wide net to find reinforcers. If you are having difficulty finding activities or items for reinforcers for students, think outside the box. Observe the student; look for what he or she does with free time. Check out these sites for tools to ask students, teachers and parents about what might be a reinforcer for a student: Jackpot Reinforcement Survey; Forced Choice Reinforcer Assessment; For more complex students, this form might be helpful: Reinforcer Survey. This procedure for assessing reinforcers might be helpful too. For older students consider making a contract and negotiating for what they want to work for. Also look outside giving an item or treat to looking at activities. Many children really like having responsibility and being a helper--even those you think would shun it the most. It gives them an opportunity to be the center of attention for appropriate behavior. Reinforcement is about selling and keeping it fresh. Half of the appeal of reinforcement for all of us is how we sell it and present it. Part of it is about being excited for young children and cool for older students. But part of it is making it interesting in the way it is delivered. Give choices, use surprises and use special interests of the students to get them excited about reinforcers. In one classroom that I worked in we had students who had lots of challenging behavior to get people's reaction. So we turned it around. For their token system, whenever they got all their tokens, we stopped the class (it was a resource class) and sang, "For he's [or she's] a jolly good fellow" and everyone in the room clapped and cheered for the student. Then they got to pick a prize from the treasure chest or the reinforcement menu of activities. In other words, we made the appropriate behaviors get a big reaction from the whole class--and it worked. Develop systems to fade reinforcers over time. You don't want to fade out reinforcement systems too quickly and have the student lose his or her progress, but you also don't want to use high levels of reinforcement forever if you don't have to. Token systems are a great way to fade out reinforcers by spacing them out. You can start with a 5-token board and move to 10 and then 20. You can increase how much is required to earn the token. Just always remember to keep the system so that the students get the reinforcer more often than they don't or they will stop buying into the system. And that brings me to the freebies I have to help with reinforcement in the classroom. 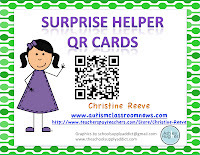 The first is a set of cards with QR codes of helper jobs that can be used as reinforcers. The students choose a card and then use a tablet or smart phone to scan it to find out what job they get to do. They have been a real hit with some students I work with who are struggling with challenging behavior and love to be the center of attention as well as another who has difficulty attending to his work (it helps him stay on task). 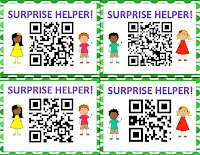 This keeps it fresh and new, sells it with surprise and the excitement of technology, and uses helper roles as a reinforcer for the student. You can download them for free from my TPT store. 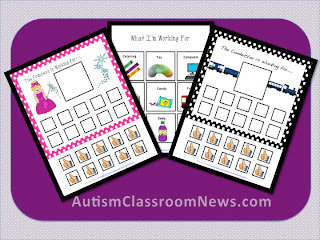 The second freebie is a set of token boards that include a set of visuals of common reinforcers and incorporate special interests of princesses and trains--both are big with my kids with autism. We all use reinforcers; our reinforcers just become more complex as we get older. I hope this has given you some fresh ideas or brought up some things to think about with reinforcers.